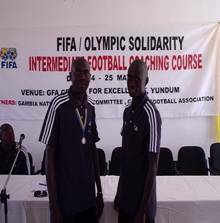 Sang Mendy and Bubacarr Demba of Gilkock Football Academy, Brufut Branch recently concluded a two week Fifa Olympic Solidarity Course organized by the Gambia Football Association in partnership with the Gambia Olympic Committee in consultation with the Gambia Football Coaches Association at the Fifa Goal Project (Center of Excellence) in Yundum. 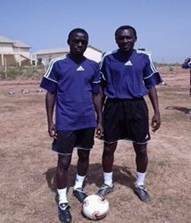 Sang and Bubacarr join twenty-eight other coaches in the Gambia to be trained for the intermediate course after successfully completing their basic course in 2003. According to Sang and Bubacarr the course has helped them and will go a long way in the development of the academy. They are ready to share what they have learnt with their players. On completing the course both coaches passed the exams. On Saturday the players of the academy thanked their coaches for their endeavor to seek for knowledge just to take good care of them on the field. Now the academy has three well-trained coaches to take care of the players. The inspirational Gilkock Academy player, Ebrima Jatta, is with the Under-20 team for a ten day training camp in Florida, USA. 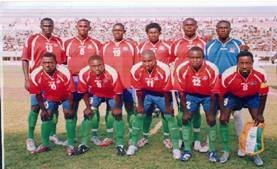 Ebrima who after his debut match on the 28th April 2007 continued to train with the team until just recently when it was announced that Ebrima has made it to the list of players hoping to travel for a training camp before the Fifa World Youth Championship in Canada. Ebrima and the entourage left Banjul on Thursday 14th June. Speaking to the Academy's website, a night before the team leaves Banjul, Ebrima expressed joy of being part of the team traveling for the training camp. He also said he has been waiting for this kind of opportunity for so long and now that it has come his way he is prepared to give his utmost to satisfy the coach whom Ebrima described as wonderful. When asked whether he is optimistic of making it to Canada, Ebrima stated that it would depend on the coaches decision, but since he’s joined the team he has always worked hard to impress and will continue to do the same. 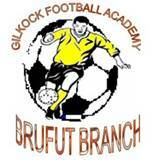 In conclusion Ebrima thanked coach Peter Bonu Johnson, Gilkock Football Academy, Hawks F.C., his family and his friends for the support they've given to him during his playing career. Watch out for Ebrima. The teenager is optimistic of a great football career.